The effective range of blast damage is less than that from an air blast because much of the energy is transmitted in the form of a ground or water shock wave. Near ground zero, however, the severity of the shock wave is greater than that of the blast wave. The distance at which thermal radiation (heat) is hazardous is slightly less than that from an air blast. Nuclear radiation is of two typesinitial and residual. Initial Radiation Initial radiation occurs within the first minute after an explosion; residual radiation occurs thereafter. In most instances, initial radiation is of little consequence because the lethal range of its effects is less than that of the blast wave. 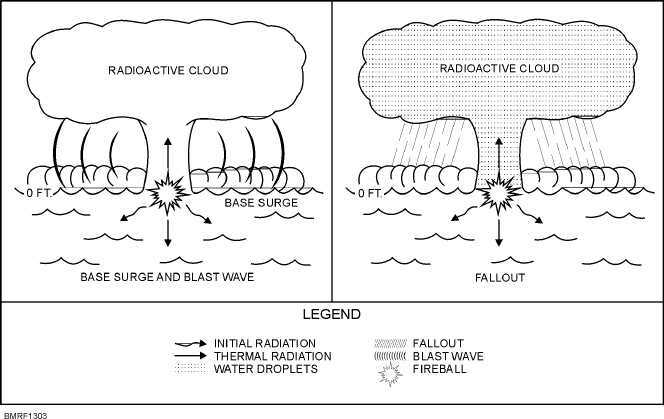 Residual Radiation Residual radiation for a surface burst is dangerous because the large amount of surface material drawn into the cloud is heavy enough to fall while still highly radioactive. Additionally, the fallout area of a surface blast is much larger than the area affected by heat and shock. SUBSURFACE (UNDERWATER) BURST In an underwater burst (fig. 13-4) a fireball is formed. However, its smaller than the fireball of an air burst and is not normal. The explosion creates a large bubble (cavity) that rises to the surface where it expels steam, gases, and debris into the air. Water rushing into the cavity is thrown upward in the form of a hollow column that may reach a height of several thousand feet. When the column collapses, a circular cloud of mist, called the base surge, is formed around the base of the 13-9 Student Notes: Figure 13-3.A surface blast.